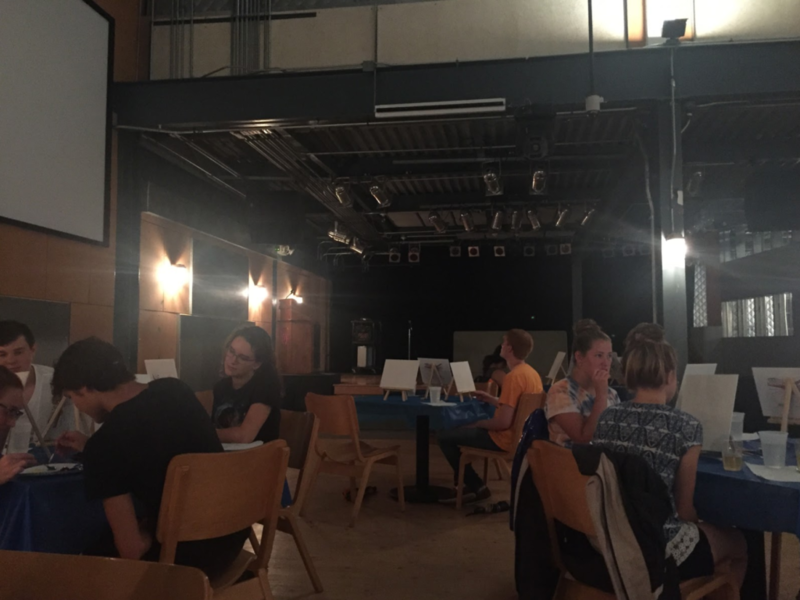 Bob Ross Alive at Paint Night | The Gettysburgian. Students enjoyed an evening of painting inspired by Bob Ross (Photo Sam Shourds/The Gettysburgian). Last Friday, September 7, a downpour ensued as 60 plus Gettysburgians gathered outside the Attic for a famous Gettysburg College Paint Night. Participants were promised “painting materials, mocktails and cheese” while they painted along with beloved American painter, Bob Ross. Upon entering the venue, participants were greeted by CAB members serving sparkling grape juice, various cheeses, crackers, and grapes at the bar. The atmosphere was filled with eager painters and Bob Ross enthusiasts sporting Bob Ross socks, shirts, and occasionally his full-on signature hair and beard. Within minutes, everyone was seated and ready to paint. And paint, they did! Throughout the 27 minute session, the painters caressed their canvases, beat the devil out of their brushes, and painted various happy little clouds and trees. The spirit of Bob Ross was very much alive, and the painters were brought together by a shared appreciation for Ross’s talent and inherent relaxing nature. Overall, spirits were high as Gettysburgians left the Attic with their paintings of Mountain Ridge Lake. Staff writer Danielle Sicotte ’22 is contemplating a major in chemistry and/or physics with a French minor. She is originally from Westminster, Maryland. When she is not nerding out in French, Danielle is usually compiling playlists for her weekly WZBT radio show and watching Monty Python.